If you’ve never jumped off an ATV while 100 feet in the air and run in place next to it before climbing back on (still in mid-air, mind you), you’re missing out on a serious rush.As a professional ATV racer, you perform a mix of realistic and gravity-defying tricks at blistering speeds across a variety of beautifully rendered exotic landscapes. 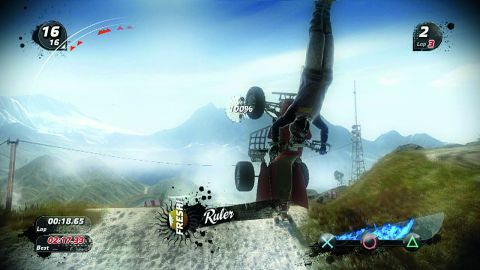 Pure’s more fantastical aspects, such as the occasional ineffectual run-in with a tree that doesn’t interrupt your rider’s acrobatics, may offendphysics purists but it sacrifices that realism to achieve an adrenaline-pumping pace that avoids penalizing experimentation with the game’s engaging trick combo system. The World Tour campaign lets you compete through 10 stages, each consisting of four to seven events, in Race, Sprint, or Freestyle modes. Freestyle and Race play essentially the same, whether you chain together tricks for points or speed boosts, but tiny courses with no big jumps limit my enthusiasm for Sprints. Like a true feel-good game, Pure rewards you with new ATVs, racer avatars, or upgrade parts after almost every event, even if you don’t take first. Pure’s extremely forgiving learning curve makes it friendly to even the most novice racers, but will fail to challenge experienced drivers. Overcoming the controls - a misguided attempt to mimic dual joysticks on a keyboard - is the real obstacle to success. A gamepad is strongly recommended. There’s some wasted potential in multiplayer, which is an uninspired replica of the single player modes without rewards, and both single- and multiplayer suffer from long load screens. But these hiccups won’t do more than stall your enjoyment. Pure is exciting fun that long-time racing fans and those looking to get their feet wet in the genre can enjoy. PC Gamer scores games on a percentage scale, which is rounded to the closest whole number to determine the GamesRadar score. Description An off-road racing game that slakes your thirst for aerial flips and tricks. Mid-air counts as off-road, right? It gives a real sense of horrifying speed and some of the tricks are pretty hard to pull off.